As I’m detailing in an upcoming app note, baluns are extremely useful devices. They can be used to interface with differential chips, build balanced amps and mixers, and drive antennas. They can also be used to create differential signaling lines that are immune to common mode noise. As you can see the insertion loss ripples along the expected insertion loss curve, along with the return loss increasing dramatically at each insertion loss suckout. So there is obviously some resonant behavior going on, the question is where does it come from exactly? The frequency of the insertion loss ripple depends on the length of the cables between the baluns, therefore there must be a stray signal rattling around on the cables. 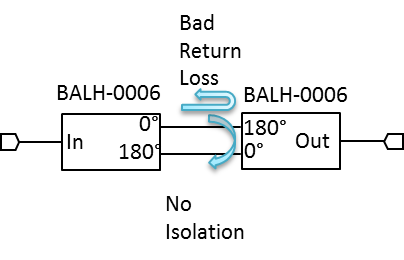 There are two potential sources for this signal: bad return loss on the output, and the lack of isolation. EIther the signal is reflecting from the differential ports of the second balun, or it is being created by the inputs traveling from one differential port to the other. Previously this signal has been blamed on the poor return loss, but this seems unlikely. 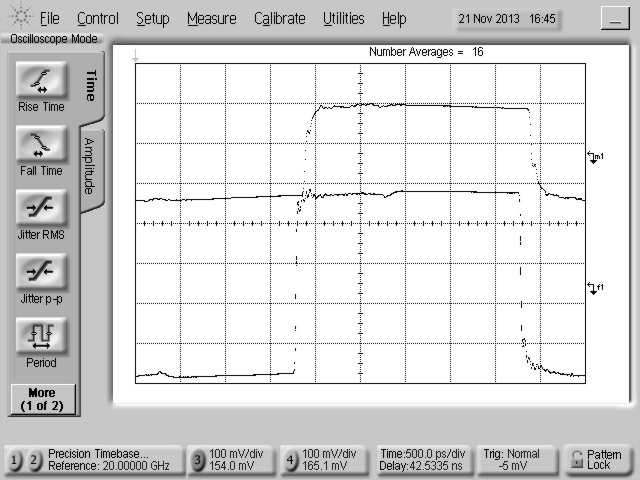 .The BALH-0006 has good output return loss, which is odd for a balun with no isolation. In general you would expect to see common mode signals (which is half of any input signal when the other port is grounded) reflected entirely. 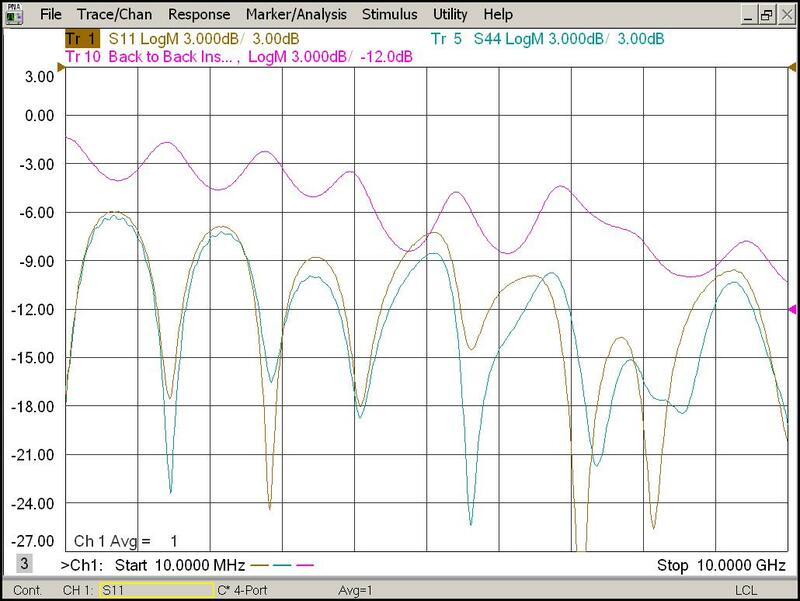 In the case of the BALH-0006, the return loss is actually better than 20 dB at low frequencies, and better than 15 dB across the band. Therefore it seems more likely that the cause is lack of isolation. The BALH has only 1 dB better isolation than it’s insertion loss, which means that almost as much power goes from one balanced arm to the other as from the balanced side to the unbalanced side. How do we prove that it is one or the other? This is where time domain techniques become valuable. First define the delay time for each step in the balun connection. Through the balun is t1, through the cables is t2, and from one balanced input out to the other (through lack of isolation) is t3. The through path, is delayed by 1 balun t1, then the cables t2, then the second balun t1, for a total delay time of 2*t1+t2. A pulse generated by a bad return loss will see the first balun t1, then the cable delay t2, then it will reflect from the other balun’s balanced outputs and go back through the cables for another t2, then again reflect for another t2, and finally pass through the last balun t1. This gives a total delay of 2*t1 + 3*t2. We will see the step arrive at a time 2*t2 after the first step output. If the ripple is dominated by the lack of isolation, the step will travel through the first balun t1, then the cable t2, then from one balanced output to the other t3, then through the cable t2, then from one balanced output to the other t3, then through the cable again t2, and finally out the last balun t1. The total time is 2*t1 + 3*t2 + 2*t3. The step will arrive 2*t2 + 2*t3 after the first step, and 2*t3 after the return loss step. First we build a square wave generator with a low rep rate (200 MHz with a 20 ps risetime) by cascading several square wave amps. Next we measure each of the time delays. First the transit time of the balun is measured to be t1 = 330 ps (not needed for the experiment). 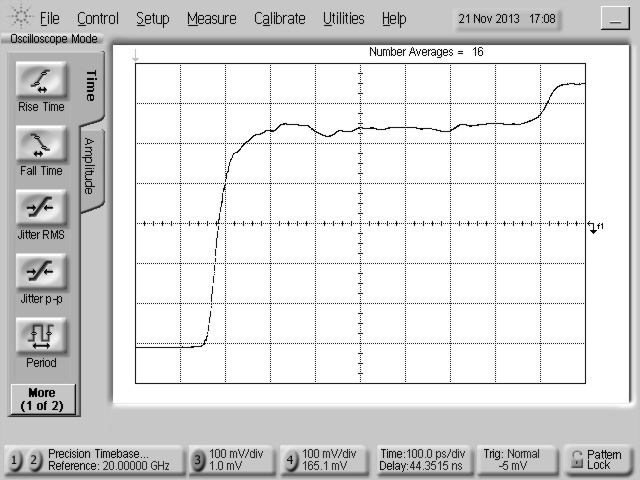 Then we look at the delay of the cable, measured to be t2 = 300 ps. 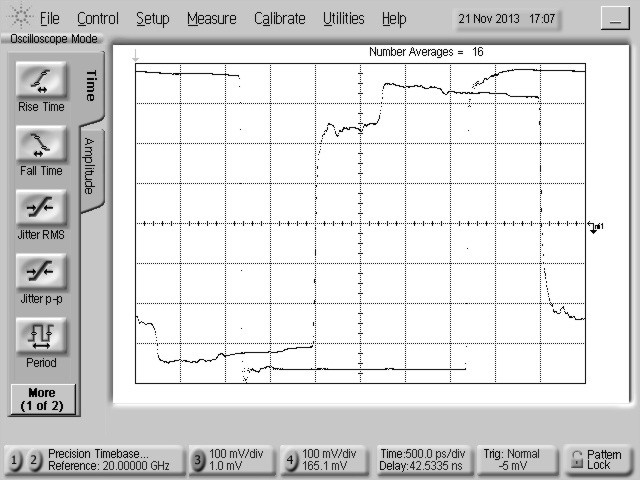 Finally the transit time from one balanced input to the other is found to be t3 = 100 ps. 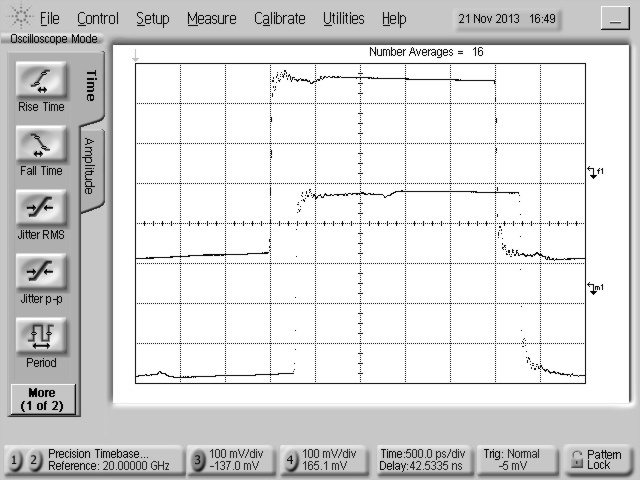 You can also see in the screenshot below that the output pulse from the second unbalanced input is still quite large. Here is what the output of the two back to back baluns looks like, overlaid with the input. You can clearly see that despite a clean input, there is a delay in achieving the full output power until some time after the initial step arrives, and further that there is some ripple on the step function in between. 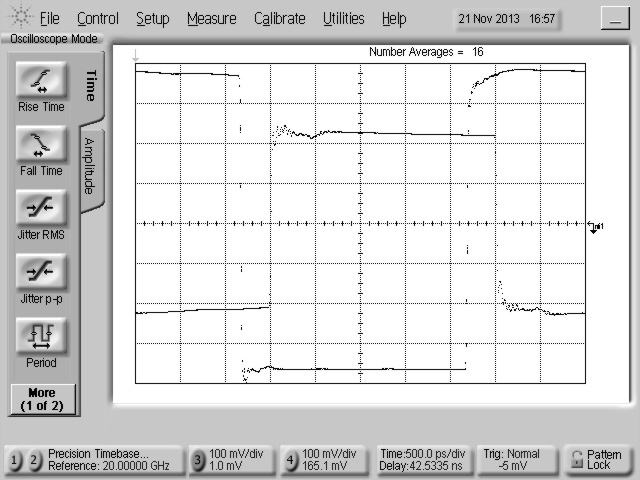 If we zoom in on the output pulse we can see the details. Here we can clearly see that the initial step, and after a delay of about 600 ps (=2*t2) there is another very small step, and finally the big step 200 ps (=2*t3) after that. So now we have the full story of what happens when you put two baluns back to back and try to send data through them. Even with a perfect return loss, the non-isolated path creates a delayed second version of the input step, distorting the output pattern. Eventually all of the power arrives at the end, but only after a long delay equal to the twice the cable delay (plus some small amount). This contradicts what is currently found in the applications literature, which blames this phenomenon on return loss problems.